Underperforming pages are the bane of every conversion rate optimization process. Never fear, we’ve got the perfect solution to your struggles! In this blog post we’ll show you how to deal with poor website performance using a Piwik PRO Analytics module. STEP 3: Test your ideas! That number’s not too impressive, is it? This is especially true when taking into account that low conversion rates have a direct impact on the company’s bottom line. Of course, there can be many sources of this problem. Nevertheless, marketing websites and their performance play a large role in achieving your desired conversion rate. 79% of online shoppers who visited poorly-performing websites say they won’t return to the site to buy again. What’s more, around 44% of them would tell a friend about their bad experience. Fortunately, today’s marketers have access to multiple sources of information on their websites’ operation. One source is analytics reports. When used skillfully, they can provide you with extremely relevant data to help you detect and fix underperforming pages. In this blog post we will show you how to use website performance analysis to achieve the results you need. To make the whole thing easy to digest, we’ll divide this process into three practical steps, with a bunch of useful tips thrown in to help. Sounds good, doesn’t it? Let’s get started! The first place you should start looking for potential bottlenecks (factors that limit performance) is in your conversion funnel report. Its shape will help you detect the exact stages of the customer journey that you should start paying special attention to. Important note! If you’re still not familiar with conversion funnels, don’t worry. Click here to find an example of a simple funnel setup: Conversion Funnel: Set It Up Like a PRO! Be sure to read this material carefully – you’ll find a lot of helpful tips in there! With that knowledge it will be much easier to spot the underperforming areas of your website you need to work on. It will also help you figure out exactly what you should change in order to improve them. Let’s review what a proper conversion funnel should look like. We’ll assume that in a correct one each step has a 50% conversion rate. A bottleneck is understood as a decrease from 50% to 10% in one section of the funnel. In each of this scenarios you certainly fall short when it comes to providing enough value to your prospective customers. You can read more about unusual funnel shapes in this article by Riverbed Marketing. At each step of the customer journey there can be different reasons for poor website performance. In the next section we’ll show you how to identify the constraints on the volume of people visiting your website. Then you’ll learn how to eliminate them using Piwik PRO Analytics. According to the previously mentioned report by Akamai and Gomez.com, 50% of users expect a site to load in 2 seconds or less, and they often abandon a site that doesn’t load within 3 seconds. And just imagine how frustrated people are when they arrive at a website where, instead of the product or service they’re interested in, they find a non-existing page. When it comes to finding 404 pages, Click Path reporting (check out the Click Path Analytics User Guide), one of Piwik PRO’s many features, comes in handy. The obvious benefit is that knowledge of where users stray from the path will help you identify the weak spots on your website, improve the user experience, and boost conversion by retaining users on the page for longer periods of time. That way, you’ll be able quickly detect and eliminate problems related to broken or dislocated pages. Browsers: to see if you have any compatibility issues. Operating system: to see if mobile users are receiving a satisfying experience. Screen resolution, flash version, or java support. Geography: maybe your site loads really slow just in certain regions? This tells you which pages require optimization to ensure better user engagement with your offer. There are a lot of websites out there. And some of them are so user-unfriendly that visitors leave as quickly as possible. Unfortunately, in most cases they never come back. According to UXeria, 88% of online customers declare that they don’t return to websites which they found unuseful. The list of sins on pages with low usability is quite long. In this blog post by Kissmetrics you can read about the cardinal ones: 7 Usability Mistakes That Will Kill Your Online Sales. In our experience, one of the biggest mistakes that reduce conversion rates are badly designed website forms. Too many fields or a bad location for the form can significantly limit the number of people signing up for your webinar, ebook, product demonstration, or whatever else you’re offering. With that knowledge you can go further and seek explanations. One thing you could do is divide your funnel into segments and see if you can spot some usability issues (affecting only a particular OS, browser, or screen resolutions). If you really can’t tell what’s making them leave your page, the chances are high that the problem is related to the quality of your copy (more about copy later in this blog post) or the structure of webforms on your site. One piece of advice! If you want to investigate more deeply how people behave on your website and which parts of it bother them, we recommend this blog post: How to Blend Web Analytics & Crazy Egg for Conversion Boosting Glory. There you’ll learn how to pair Piwik PRO with Crazy Egg (a heat map and scroll map reporting tool) to acquire even more detailed user insights. Practice shows that limiting the number of fields in forms to the absolute minimum is usually a very good idea. Statistics presented by Unbounce.com show that you can increase conversions as much as 120% by shrinking forms from 11 fields to 4. There’s a really good chance this solution work in your case. If you’re still not convinced, this extremely well-researched article by ConversionXL may dispel some of your doubts: Should You Really Reduce Form Fields? According to Kissmetrics, bad content structure and boring content are two of the main reasons why people decide to leave a website. How can you see if this problem affects you? Poor content that doesn’t engage readers is recognizable by low conversion rates and high bounce rates of pages. So, if your analytics reports point to this type of problem and you can’t spot any other issues (like ones related to usability or technical problems), poor content might be the reason why your visitors are deciding to leave your page. Of course, we expect some pages to have a high exit rate (for example, a blog post page where users don’t find anything else that would keep them from leaving). But a high exit rate for landing pages certainly means that your users aren’t behaving the way you’d like them to. Fortunately, this type of issue can be spotted in an Exit pages report. As you can see, this comparison generates a ton of actionable information. You can identify whether there are any vital pages on your website with high exit and bounce rates. In addition, you can also see if users are exiting your site in the places you expect them to. This gives you the knowledge necessary to know which pages require optimization so you can ensure better user engagement with your website’s offer. Looking for inspiration on how to improve your website’s content? This exhaustive guide by Neil Patel will certainly give you some actionable ideas: 13 Ways to Reduce Bounce Rate and Increase Your Conversions. Information from analytics reports can definitely give you some ideas for improvements you can implement on your website. Remember, however, every hypothesis should be tested using the A/B test method. This method will tell you exactly which changes can contribute to increased conversion rates and greater user satisfaction. A/B testing is used to test different elements of web content by comparing two versions, usually planned changes vs. the original. 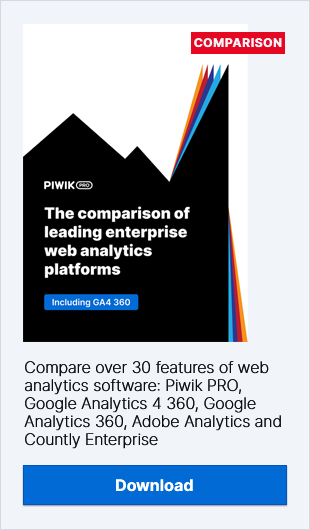 We think that the best way to perform these tests is by pairing Piwik PRO Analytics insights with the capabilities of Piwik PRO Tag Manager and Optimizely. Learn more about it from this blog post: Launching A/B tests using Piwik PRO Tag Manager and Optimizely. We hope that our guide has provided you with some actionable tips on how to perform a proper website performance analysis. However, we’re aware that you still might have some unanswered questions. If this is the case, don’t hesitate to contact us and share your thoughts – our team will be happy to help you!